No need for travelling between the hotel and the boat and no need for assembling and disassembling your equipment every day as with daily diving programs. You can visit dive sites that are farther from the usual daily diving sites and liveaboards have a more favourable price/value ratio. With liveaboards you can travel to distant dive sites that cannot be reached by daily boats. There are also sites that can only be accessed by zodiacs. This way you can dive at less frequently visited places avoiding the crowds and where the reefs and corals are in a lot better condition. And you can meet up with marine life that you would not otherwise see during daily diving trips. Diving safaris provide a lot more flexibility than daily diving trips. Liveaboards can easily change anchoring location if the given dive site is too crowded, for example, or if the group would like to dive less at one place or more at another (if possible) or if sites must be changed due to unfavourable weather conditions (currents, winds, gusts). During safaris diving is performed in smaller groups than during daily diving, thereby avoiding crowding. This way everybody can discover the wonders underwater under more relaxed conditions. We provide Nitrox onboard our liveaboards with a 32% mix to Nitrox-certified divers. After arriving onboard and following the general briefing, every diver assembles his/her equipment, places it in one of the stations and this will be his/her designated place for the entire week. There is a routine that is easy to follow and there is no need to carry equipment and assembling/disassembling it every day. The dive guides will be the same during the whole week. The captain, the chef and the crew get to know everybody and are able to provide personal assistance and service to everyone onboard. 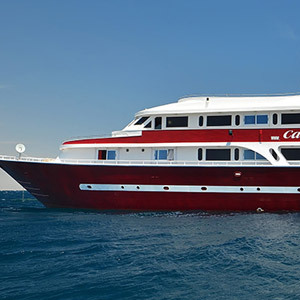 Liveaboards have improved a lot since the time of Cousteau and today comfort is one of the most important aspects of travel. Every cabin has its own en-suite bathroom with toilet, sink and shower. Cabins become the home to every diver during this one week. Comfortable beds, plenty of storage space and air-conditioning ensure enjoyable nights and days during the week. There is a charging station on our boats where lamps, cameras, batteries, phones and laptops can be charged. No need to leave modern technology at home. You can do underwater photography and videography and your photos or videos can be watched right away on the large LCD TV in the salon or you can share them with your friends. Where mobile coverage is available, you can use our WIFI services onboard free of charge. Our chefs cook up one mouthwatering dish after the other every day. The abundant buffet-style meals served up three times a day fulfill every need. The menu includes soups, roasts, fish, salads, side dishes and sweets. We also serve you sweets and fresh fruits during the day. You can also help yourself to mineral water, soft drinks, coffee and tea. Besides diving, you can snorkle, swim with dolphins, relax, listen to music, read, watch movies in the air-conditioned salon, smoke shisha in the one-of-a-kind Arabian cafe, sunbathe on the sun decks, enjoy the gorgeous view, the sunsets and the star-filled sky and of course, make new friends. This week is about diving and relaxing. Diving safaris are often more affordable than daily diving programs. 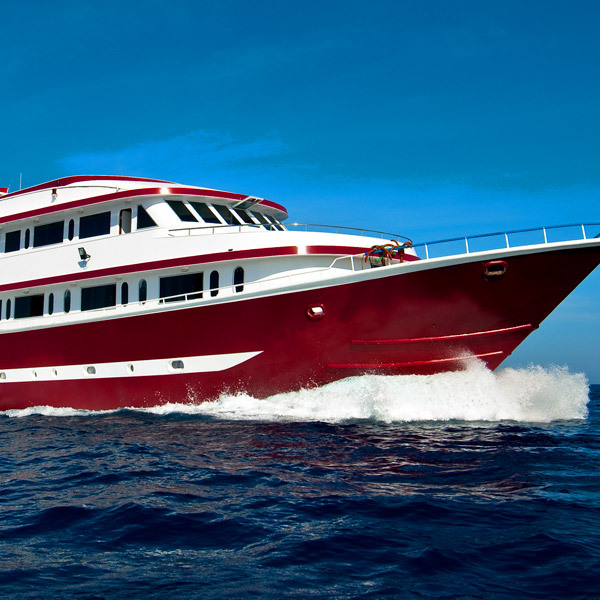 The liveaboard price includes full-board accommodations, transfers, diving and 12l tank use. The only additional expenses would be (if needed) for equipment rental, Nitrox use or other personal expenses.